The Order of Antioch was founded in 1928 by Archbishop Frederick E.J. Lloyd at the direction of Prince-Abbot Joseph III, and is primarily contemplative in nature, being devoted to prayer and the private celebration of the Mass. It serves as a source of unity for orthodox clergy in the succession of Prince-Abbot Joseph III and commemorates both his ministry and the Syrian-Antiochean succession that he brought to the West. From 1960 onwards the Order was under the High Protection of H.I.R.H. Prince Louis Ferdinand of Prussia. Since his death in 1994 the High Protectorate of the Order has been vacant. Until his death in 2015 the Royal Patron was H.S.H. The Most Revd. Prince Kermit William Poling de Gniezno, OA(Comm), Bishop of the Apostolate of the Order of the Holy Wisdom. For much of its history, the Order was open only to bishops. In recent years, it has expanded its scope and now admits priests and deacons as well. The worship of the Order of Antioch is that of the Universal Church in all ages. The Mass is celebrated in conformity with the essentials of the Tridentine Rite, either in Latin or in the vernacular, and with or without a congregation being present. In addition to the use of the customary rites, the Abbey-Principality has its own Liturgy in the English language, commonly known as the Rite of Perfection, which was developed under Archbishop Frederick E.J. Lloyd of the Order of Antioch during the 1920s. This Liturgy is compiled from the treasures of devotion of all branches of the Christian Church. The teaching of the Order of Antioch is Catholic in scope. It can be summarized as follows: First – The Words of Christ. Second – The Words of the Apostles. Third – The teaching of the Catholic Church. Any teaching that is contrary to the first two cannot be deemed to be the teaching of the True and Catholic Church. The Order maintains that the Catholic Faith, The Communion of the Faithful, has always and everywhere worked for the salvation and redemption of man. St Augustine alluded to this when he said that Christianity had always been in the world; and to which the New Testament also alludes when referring to “the LAMB slain from the foundation of the World”. This Religion which always was “and in all ages entering into HOLY SOULS maketh them friends of GOD, began with the coming of Christ to be called Christian.” Therefore the Order of Antioch has been established to perpetuate the ancient traditional marks of the complete, whole Catholic and Universal Church. The Church throughout the world has suffered in its expression of this completeness. When only two or three of these marks or characteristics find expression, that portion of the Church ceases to express its Catholicity, and separation or denominationalism is manifest, instead of universality and brotherly communion. The Order of Antioch recognizes the Malankara Orthodox Syrian Church (also known as the Indian Orthodox Church) as its parent body, that church having been responsible for the episcopal consecration of Prince-Abbot Joseph III as Metropolitan of the Old Catholics in the United States in 1892. A relationship of friendly contact and dialogue exists between members of the Church and the Order. The Order of Antioch is a member communion of the German Chapter of the International Council of Community Churches (ICCC). The ICCC is a member of the World Council of Churches, Churches Uniting in Christ and the National Council of Churches USA. 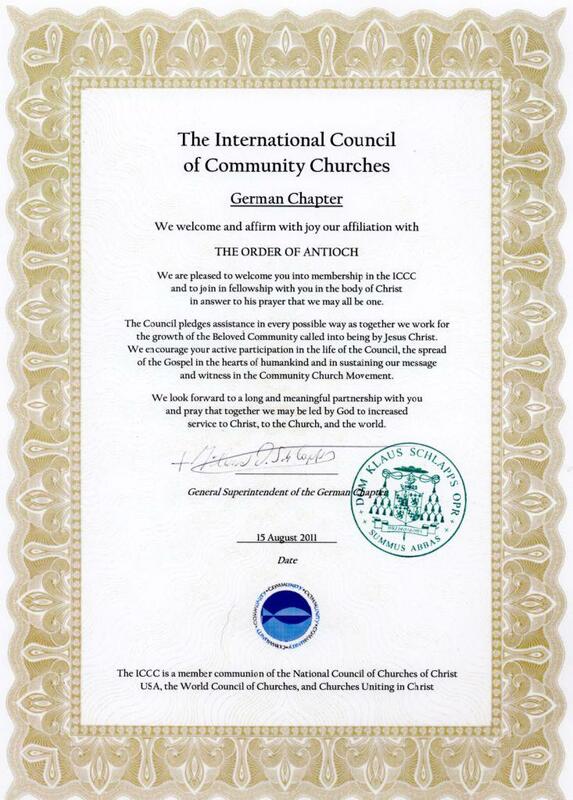 The former General Superintendent of the German Chapter of the ICCC, the late Dom Klaus Schlapps OPR, was a member of clergy of the Order. The Order’s Second Class of membership permits the admission of clergy whose service is bivocational and who serve ecumenically in another communion. In this way it serves as a means of Christian Reunion and promotes fraternal co-operation among the clergy of the Antiochean heritage. 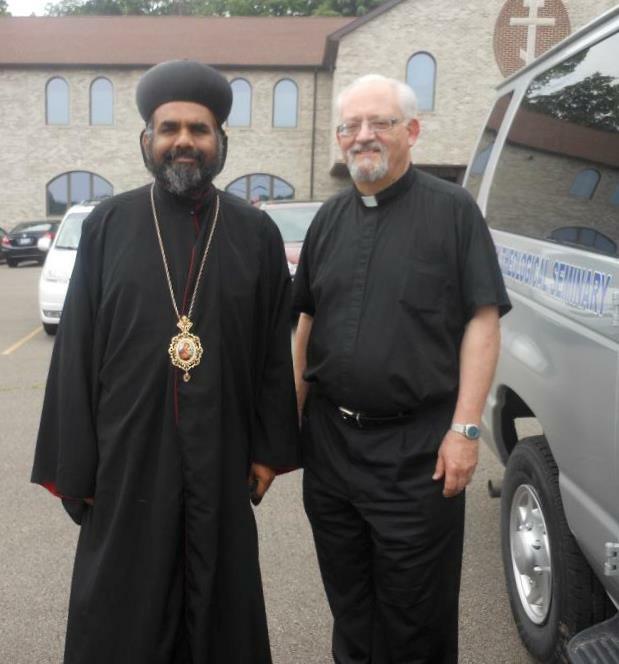 In the past, such clergy have included bishops of the Union of Scranton/Nordic Catholic Church, the American Catholic Church, the Orthodox Catholic Church of Great Britain, the Catholic Apostolic Church (Catholicate of the West), and the British Orthodox Catholic Church. A special relationship has also existed between the Order and the American Catholic Church, founded by Prince-Abbot Joseph III in 1915, for many years. The ecumenical work of Prince-Abbot Edmond II through the former American Council of Ecumenical Churches, of which the Order was a member, should also be noted. The Statutes establish the formal and canonical governance of the Order. The Order admits existing clergy in the orders of deacon, priest or bishop to membership, providing that any one of their major orders have been received in the Antiochean Succession.